They either planted the gun, or shopped it into the picture. It's NOT in the video! Where did that photo come from because that angle is a completely different angle and the frames aren't even matching. 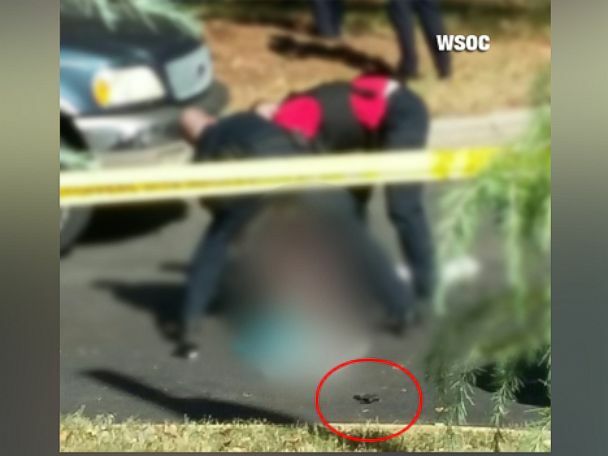 photo with gun shows cop with legs over victim, the video still it is him kneeling. Can't use these photos as comparison. Her claim that he is unarmed, because he has a TBI, isn't even logical. People with those are quite often violent and confrontational. Hubby knew some like that, in the military. Plus, if he had no gun, what was she telling him not to do? She knew he was armed, and was hoping to talk him down, is my best guess here. That they won't release video, with all of the rioting, just says to me that they want the rioting to continue. Clear video of him with a gun would remove all excuses. Interesting...so she is screaming for her husband "Keith don't do it" What is she telling him not to do? She's telling him to NOT get out of the car! I couldn't really figure out whether she was telling him "don't do it" because her husband had pointed the gun at the officers or if she was telling him "don't do it", meaning don't get out of the car. Confusing. She seemed to be trying to make matters worse. Maybe she wanted him shot. Sorry....that wasn't a nice thing to say, but you never know. I can't figure out how a wife could hold a phone so steady when something like this is coming down. Yes, yet somehow not steady at all, in the key moments, when her video might have shown him to be armed, as the police have stated! That alone is suspicious, to me. Yes, you're right. I watched it again. Why did they want to him to get out of the car? Why did they have to break the window? He was no threat while sitting in his car, windows up! This is so bad! No wonder they rioted! "No wonder they rioted"?!!?!? Right...because nothing says "Don't treat us all like criminals" better than rioting, looting, destroying property, and assaulting innocent people! Why did the officers speak to the victim at all? He was in his own vehicle minding his own business. Running the plates would confirm he was not the person the warrant was issued for. From what I read when the story first broke, he got out of the car, with the gun, then back in, catching their attention, then exited again, refused to drop it, and was shot. If he actually did have a TBI, that sort of behavior isn't unheard of. He shouldn't have been armed at all, with that, not to mention being a felon, according to reports. I don't think he was armed. I haven't? I guess that's why you've ignored every counter-argument I've made to your claims in favor of spewing further nonsense. As for my "claim" - clearly you're not looking terribly hard. What am I supposed to find in that link? Please quote the passage that proves your claim.